One of my favorite Haruki Murakami stories is "The Elephant Vanishes"—part of an earlier collection published in 1991—in which the narrator watches as an elephant in a zoo grows smaller and smaller until finally the elephant disappears. No explanation is given, there is no resolution, the vanished elephant remains a mystery at the same time that the narrator's life is changed forever. 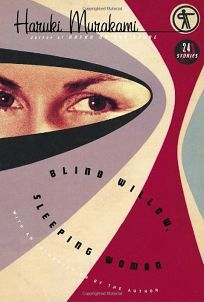 Blind Willow, Sleeping Woman , Murakami's new collection of 25 stories, many of which have appeared in the New Yorker and other publications, also describes these epiphanic instances. In the title story, a character who is half deaf, alludes to a John Ford movie, Fort Apache , in which John Wayne tells the newly arrived colonel that if he actually saw some Indians on his way to the fort that means there weren't any. Everything is a bit off—including of course the blind willow trees whose pollen carry flies that burrow inside a sleeping woman's ears—as in a dream, where explanations are always lacking but where interpretations are plentiful. In "Mirror," the narrator sees someone who appears to be both himself and not himself in a mirror and then finds out the mirror does not exist; the disaffected woman—a lot of Murakami's characters are handicapped or incapacitated in some physical way—in "The Shinagawa Monkey," loses her own name; in "Man-Eating Cats," the narrator's girlfriend disappears and as he searches for her finds that "with each step I took, I felt myself sinking deeper into a quicksand where my identity vanished." Murakami's stories are difficult to describe and one should, I think, resist attempts to overanalyze them. Their beauty lies in their ephemeral and incantatory qualities and in his uncanny ability to tap into a sort of collective unconscious. In addition, a part of Murakami's genius is that he uses images as plot points, going from image to image, like in the marvelous story "Airplane," where, while making love, the narrator imagines strings hanging from the ceiling and how each one might open up a different possibility—good and bad. It is clear that Murakami is well acquainted with the teachings of Buddhism, western philosophies, Jungian theory; he has a deep knowledge of music and, also, I have been told, is a dedicated, strong swimmer. In his stories, he roams freely and convincingly through all these elements (and no doubt many more) without differentiating to create a world where cats talk and elephants disappear. In the introduction to this collection, Murakami writes how, for him, writing a novel is a challenge and how writing short stories is a joy—these stories are a joy for his readers as well. Lily Tuck's most recent novel, The News from Paraguay, won the 2004 National Book Award.